Beijing has deployed fourth-generation fighter aircraft to Woody Island in the South China Sea. 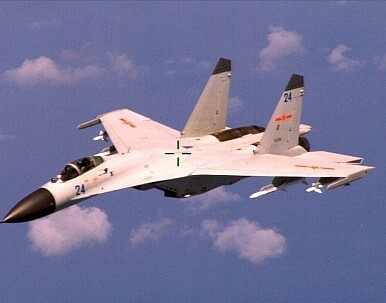 The People’s Liberation Army Air Force (PLAAF) has dispatched an unknown number of fourth-generation J-11BH/BHS fighter aircraft to Woody Island (known as Yongxing Island in Chinese), the largest of the Paracel Islands administered by the People’s Republic of China in the South China Sea, according to Chinese media reports. Woody Island, located around 200 miles (321 kilometers) south of Hainan Island, boasts the only operational airstrip in the South China Sea, although China is in the process of construction of at least two more airstrips in the Spratly Islands. The J-11BH/BHS fighter aircraft are most likely part of the People’s Liberation Army Navy’s 8th Aviation Division stationed in Hainan Province. As my colleague, Ankit Panda, reported at the beginning of the month (See: “Chinese J-11 Fighters Exercise in the South China Sea After US Navy Patrols”), J-11BH/BHS fighter jets armed with missiles have recently carried out exercises in the South China Sea rehearsing “real air battle tactics,” according to the PLA Daily. The exact number aircraft deployed to Woody Island and their deployment schedule are unknown, although it is highly unlikely that individual units will remain stationed for long stretches of time due to the difficulty of keeping advanced fighter jets operational under difficult climate conditions prevalent in the South China Sea. “My understanding is that fighters are likely only to be deployed for short time frames in the Spratlys – the salty sea air would cause havoc to the aircraft over long periods,” Bonnie Glaser, a China analyst told Defense News. Alexander Huang, a Taiwan-based defense analyst, highlights that the salty sea air is in particular an issue for modern fighter aircraft stationed on off-shore islands in the South China Sea. “If they intend to place J-11 on Woody Island around the year, it would be an ‘all-weather’ test to the airframe, parts and combat systems onboard before I do military implication analysis,” he added in an interview with Defense News. The J-11BH/BHS is a single seat, twin-engine air superiority fighter produced by the Shenyang Aircraft Corporation. It is based on the Soviet-designed Sukhoi-Su 27. The PLAAF currently operates around 260 J-11 of all types. In the past, the PLAAF purportedly had troubles with the indigenously-developed jet engine for the J-11, which required servicing after 30 hours, in comparison to 400 hours for Russian-made engines. The deployment of J-11BH/BHS aircraft will be an additional obstacle for U.S. surveillance aircraft monitoring Chinese activities in the South China Sea. Stationed at Woody Island, rather than Hainan, J-11 fighter aircraft will be able to extend their operational range in the South China Sea by up to 223 miles (360 kilometers).